This is the best bread! The orange zest and cranberry combo make it out of this world good! It is a beautiful holiday bread and I make it for breakfast and serve it warm out of the oven with coffee or tea. I toast it up the next day (if there is any left) and slather it with butter...yum! I love it because it's easy to make and especially because it never dries out. I bake it and I don't have to worry about leaving it out on the counter. I give this one away as Christmas gifts too! You'll need a dutch oven for this one....I use my lodge combo cast iron dutch oven (see link below). 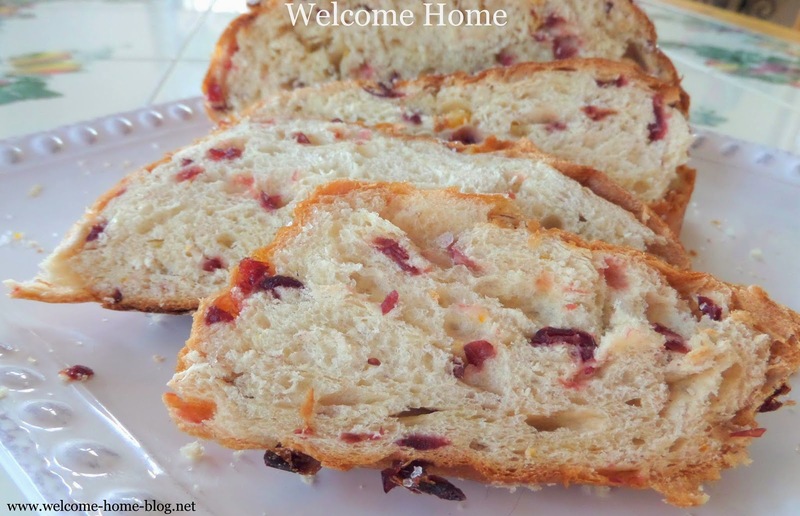 In a large mixing bowl, whisk together flour, salt, yeast, cranberries and orange zest. Add water and almond extract. Mix until well combined. Cover bowl with plastic wrap and set aside for 12-18 hours in a warm draft-free spot. I make mine the night before so that it will be ready to bake in the morning. Preheat oven to 450 degrees. Place Dutch oven with lid in the oven, and heat for 30 minutes before adding dough. While the dutch oven preheats, pour dough on a heavily floured surface and shape into a ball. Cover with plastic wrap until Dutch oven is preheated. Remove the Dutch oven, and drop in the ball-shaped dough. Cover, and return to oven for 30 minutes. After 30 minutes, remove the lid and sprinkle with coarse sugar topping and then bake an additional 15 minutes. Next, remove bread from oven and Dutch oven. Allow to cool on a wire cooling rack before serving. This recipe makes one round loaf. I use my Lodge Combo Cooker that I got at Amazon.com with my Welcome Home fan discount. Click on the link for a fantastic buy on this combo and order yours today. Proceeds go to the NO KILL Advocacy group to help save the lives of dogs and cats who are killed unnecessarily while waiting for their forever homes. I have to try this. 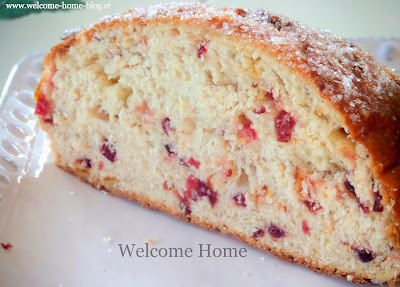 Cranberry orange is my favorite breakfast bread. In what other type of pan could this be made and would I follow the same baking instructions? I really would like to make this for Christmas morning! Good Things Come In Little Jars!